As the Chief Executive of Griffin & Howe, Guy Bignell is leading the charge into a new category of extreme sport for the wealthy clients who typically purchase from him their Purdeys, Krieghoffs, Lebeau Courally and William & Son sporting shotguns. Mr. Bignell is renowned for his ascots, English shooting vest and famous pink slacks. Now imagine this dignified British gentleman head-to-toe in black tactical gear, armed with a Mossberg pump, kicking in the door of a shoot room ready to neutralize a hostage situation. With the same aplomb that Mr. Bignell morphed from chief executive of America’s finest purveyor of shotguns and rifles into a tactical gladiator, his proficiency from racing classic Jaguars at Goodwood, West Sussex was quite evident as he strapped himself into the driver’s seat of a beat-up reinforced Ford Crown Vic ready to strategically ram a car out of his way. Guy Bignell cautiously navigates a corridor in a shoot room at Blackwater USA. Now team up Mr. Bignell with Jim Sierawaski, the burly former Navy Seal and Vice President of Domestic Training at U.S. Training Center (which the media still calls Blackwater USA and you can still purchase Blackwater gear in the pro shop). Together they concoct a mind-blowing shooting and high-speed driving training session whose price of admission is worth the bragging rights alone. Why do we consider the Blackwater experience an extreme sport? In part because the stakes are so high, but also the undeniable fun factor makes you giddy after a lap on the course or a run-through in the shoot room with a pump gun. Fully immersed in the training, the grave consequences permeate every move and thought. You keep telling yourself “Don’t screw up…this is serious.” And yet the sensation that follows is not mere relief; it’s a high-octane adrenaline cocktail that eggs you on to breathe more of the same air as bona fide heroes. If you have any doubt, watch our exclusive video of the Blackwater Evasive Driving Program. A steady drizzle ratcheted up the fear factor as you’ll see car parts flying, high-speed pursuits and adversaries popping out from between parked cars shooting at us with percussion caps. You’ll also hear tires squealing, engines racing, radio transmissions, our instructors in action and full metal-to-metal contact…some of it intentional, some accidental (mea culpa). Shotgun Life had received permission from Mr. Sierawski to bring a helmet camera for the Evasive Driving program – most likely making Shotgun Life the first publication to release personal footage of this thrilling experience. 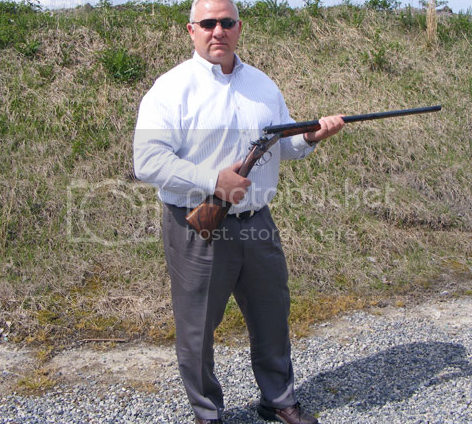 Jim Sierawaski wielding a Purdey Hammer Gun from Griffin & Howe, as he stands in front of a berm on the target range we used for the Home Defense course. The practical aspect is that you walk away with a catalog of new skills capable of protecting your family in deadly situations. 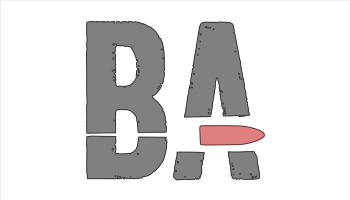 Upon completion, you’ll have the knowledge to breach rooms, ram hostile vehicles aside for a safe escape, learn protective tips for home and business, and understand what it means to be fully aware and at-the-ready in a world gone mad. You’ll also receive a certificate to frame and hang on the wall. Unfortunately, not everyone who applies for this course through Griffin & Howe will be accepted. Background checks are mandatory. Deposits are required up-front. And you must be willing to eat shoulder-to-shoulder in the chow hall the same portion-controlled, steam-table buffet served to elite military and police specialists from around the world. 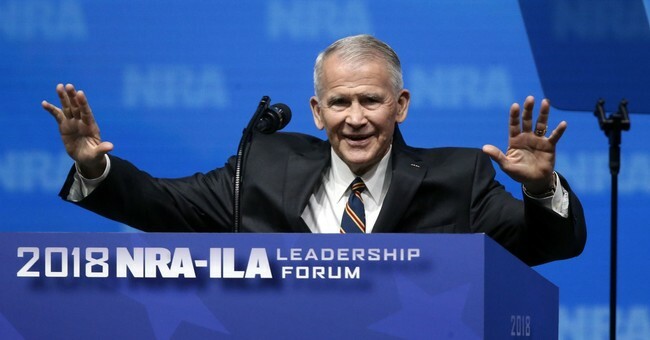 Mr. Bignell, along with Paul Chapman, Griffin & Howe’s Vice President and Director of Gunsmithing, spent 48 hours with me in mid-April 2010 at the 7,000-acre compound of U.S. Training, stubbornly prominent as Blackwater after a parent-company name change in early 2009 to Xe (pronounced zee). The switch followed a controversy in Iraq that sparked international headlines. Later that year, a Federal judge exonerated the Blackwater security personnel of all charges. Griffin & Howe’s Paul Chapman ready to breach a room. The Blackwater Lodge and Training Center, the subsidiary that conducts most of the international operations and domestic training, had been rebranded U.S. Training Center Inc. –the group that would lead our classes. This had been my second visit to Blackwater, but the first for Mr. Bignell and Mr. Chapman. My original intention was to field test a few pump guns for home defense – admittedly far flung from the coverage of fine shotguns and luxurious destinations that Shotgun Life readers and Griffin & Howe clients have come to enjoy. My second foray came in response to the enormous reception from Shotgun Life’s initial Blackwater story titled The Accidental Commando published in July 2009. The idea of Mr. Bignell and Mr. Chapman attending Blackwater had actually been hatched over a dinner of Chinese take-out in the kitchen of Hudson Farm, where I had mentioned to Mr. Bignell my upcoming trip to Blackwater. He immediately identified several Griffin & Howe clients who would jump at the chance of enrolling in courses at the same legendary compound that trains Special Forces and law enforcement elite. Blackwater instructors include select Navy SEALs, Army Rangers, SWAT Teams and Special Forces from Australia, Canada and elsewhere. Under the tutelage of these professionals, our curriculum would include day one in Home Defense Training with a shotgun, and day two dedicated to learning the basics of Evasive Driving on Blackwater’s private track designed for the fine art of eluding bad guys and saving your skin. Irwin Greenstein preparing to enter the one the Blackwater shoot rooms. 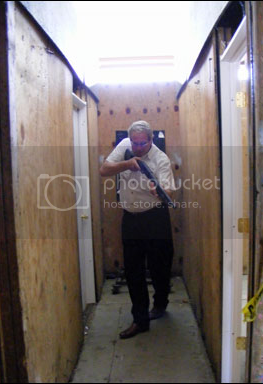 In this photo, he “pies” off small sections in front of the door to determine if the area is occupied by friend or foe. The logistics between Shotgun Life and Griffin & Howe for our Blackwater adventure were finalized at the posh 6th Annual Bray’s Island Shooting Expo held this year April 16-18 at the gated sporting community in Sheldon, South Carolina. Mr. Bignell and Mr. Chapman would drive to Blackwater after packing up their exhibit of fine shotguns and rifles. Meanwhile, I would drive straight to Moyock, North Carolina – the location of the Blackwater compound. We expected to rendezvous at Blackwater’s Black Bear Inn at about 6:00 PM for cocktails and dinner. The exhilaration of Blackwater is palpable as you drive another few miles to the Black Bear Inn. The compound conjures up a movie set. There’s a sensation that the sprawl of military gear is a work-in-progress, as equipment is continually moved and updated to accommodate the standard and custom programs Blackwater offers to its international clientele. I was first to arrive at the Black Bear Inn. The log exterior suggests a luxurious hunting lodge. But top accommodations at the Black Bear Inn provide you with a tight room, single bed, cramped shower, folding chair and table, and an undersized TV. There’s no closet, no iron and no moisturizer. Mr. Sierawaski said Blackwater expects to break ground on a hotel in a nearby plot where I last saw a mobile mess truck engaged in maneuvers. The new accommodations, slated for completion in 2012, will be more luxurious than the Black Bear Inn. Nevertheless, I do not foresee featherbeds and doilies. Part of the fleet of cars used by Blackwater for the evasive driving course. We took the wheel of these monsters on the track. After unpacking, I went to the parking lot for the last few minutes of sunset over the flat terrain. Automatic gun fire carried in the gentle breeze as the fireball sun sunk below the horizon. The Griffin & Howe Suburban pulled up and out stepped Mr. Bignell resplendent in his British attire from Bray’s Island. In the ensuing hours, the three of us enjoyed cocktails and a dinner of Southern fried chicken before retiring to get an early start the next morning. We met in the mess hall for a soldier’s breakfast buffet: scrambled eggs, bacon, sausage, chicken patties, potatoes, breads, cereal, coffee – all you can eat. The vast, bright space was filled with military and law enforcement personnel. Ready to start, we drove to the armory. Ithaca Gun Company sent me their Model 37 Defense shotgun and Benelli had supplied a Nova pump for the evaluation. Blackwater, meanwhile, issued us a Mossberg 590A1. Next stop was a classroom where we would participate in the lecture portion of the U.S. Training Center Home Defense course. Our instructors were Russ Renner, a Blackwater Afghanistan veteran and the lead instructor in home defense; and Charlie Slocum, who spent nearly 29 years in Naval Intelligence and the Royal Marine Commandos and is a leading firearms authority. Benelli’s Nova Tactical Pump shotgun. Weapons aside, we were taught that the biggest deterrent to becoming a victim is developing a heightened sense of awareness. Although the course was called Home Defense, the tutorial focused on the bone-chilling message about remaining alert and attentive in public. Cell phones, ear phones and too many packages tend to distract us from monsters lurking in parking lots, garages and stores. As applied to our everyday lives, vigilance is the best defense. Blackwater favors the Cruiser Safe Load where a shotgun may be “transported while at the same time being ready for use.” Cruiser Safe Load involves the safety in the “on” position, bolt closed on the shotgun with a fully loaded magazine, and the chamber empty. When a threat appears, you shuck in a shell and the shotgun should be ready to fire. Always keep your finger off the trigger until it is necessary. 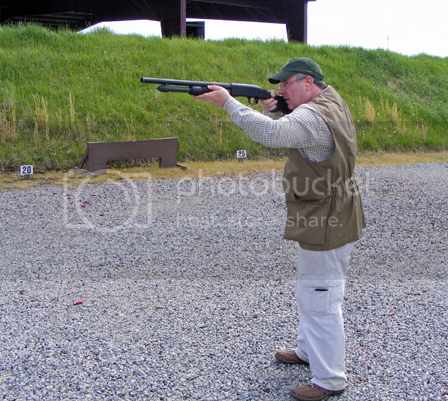 Other shotgun topics covered in the classroom included Unloading, Stoppage Clearances, Weapon Deployment (including the proper stance, grip, trigger control and breathing), and Ready Positions. It’s moments like this one that make the training at Blackwater USA an extreme sport. Irwin Greenstein is about to find out what’s on the other side of the door. 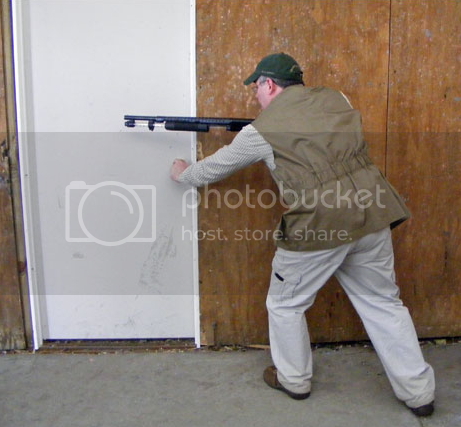 Use of the shotgun in home defense is complemented by a common-sense approach to home security measures. The syllabus states that “Criminals are inherently lazy by nature. They will be drawn to the easiest, least obtrusive target of opportunity.” What does that mean to you? Make sure you have strong locks and doors. Blackwater shows you which types are the most effective. Pay particular attention to garage-door keypads. One useful tip is that worn keys leave a breadcrumb trail to the combination. When it comes to windows, check the locks. Let everyone know you have an alarm system by posting signs. You can even go as far as installing a video surveillance system. Ultimately, the course gives you a laundry list of safe practices to fortify your home. We subsequently covered the topic of House Movement. Before we even entered the shoot room, our instructors used the syllabus to teach us the systematic approach for examining a building that’s been penetrated. Knowing this vital information could save your life and the lives of your loved ones. Topics covered in House Movement featured Slicing the Pie for looking around door jambs, Corner Clearing for interior views and Open Door vs. Closed Door in terms of searching for intruders and possible hostages. Before the afternoon in the shoot room, we were drilled in the basics of tactical pump guns. Paul Chapman on the range. After the classroom instruction, we broke for lunch followed by a session on Shooting Range 3, which is basically for pistol training. This is where I found the opportunity to compare the Ithaca Model 37 Defense, the Benelli Nova and the Mossberg 590A1 using both 1-ounce, #8 shot loads rated at 1290 fps, and slugs. Given that the course was “Home Defense,” I conducted the informal tests at 20 yards or less. In effect, I only spent about 15 minutes per shotgun shooting at 12-inch by 12-inch steel plate targets. We were on a schedule, plus I did not have access to the entire range since Mr. Bignell and Mr. Chapman were taking instructions next to me on home-defense shotgun tactics. Ithaca’s Model 37 Defense shotgun with walnut trim defends your home in style. — The Benelli Nova patterned well at 20 yards shooting the 1-ounce, #8 loads. The action was smooth. It had the lowest recoil and muzzle jump of the three pumps. –The Ithaca Model 37 Defense shot somewhat high for me with those loads compared with the Benelli Nova. The disparity may be attributed to the difference in the dimensions. The drop at heel for the Model 37 Defense was 2 inches compared with 2¼ inches for the Nova. While the Model 37 Defense had a 14 inch length of pull, it was 14¼ inches for the Nova. The drop at comb was virtually identical for both shotguns at approximately 1¼ inches. I would just have to say that the Nova was personally a better fit. As a result, I also found the recoil to be somewhat heavier in the Model 37 Defense than the Nova. I would have to say that if both shotguns shared matching dimensions, the shooting experience would be nearly identical. — Using the 1-ounce, #8 loads, the Mossberg 590A1 produced the lowest recoil and least amount of muzzle jump. But switching to the slugs brought out the ugly side of the Mossberg. Recoil was brutal and painful to the face, and the muzzle jump was extreme. — Recoil with the slugs on the Ithaca Model 37 Defense went straight back into my shoulder for a controllable experience with far less muzzle jump than the Mossberg 590A1. — Of the three shotguns, the Benelli Nova delivered the lowest recoil and muzzle jump with the slugs. Now which one would I buy? First, let’s look at prices. The Ithaca Model 37 Defense 5-shot capacity in 12 gauge or 20 gauge cost $499 for the black gun and $539 in walnut. There’s an 8-shot version of the Model 37 in 12 gauge only priced at $519 for the black model and $549 in walnut. The Mossberg 590A1 ranged in price from $574 to $608. And the Benelli Nova came in with the lowest price of $449. Overall, I would give a tip of the hat to the Benelli Nova. That said, however, if the Ithaca had fit me as well as the Nova, I would go for the walnut model of the Model 37 Defense. Aesthetically, the Ithaca would be my personal favorite. You could easily argue the value of aesthetics in life-and-death situations with little resistance, but I just liked the looks of the Model 37 Defense in walnut. Ultimately, if you expect to fend off a marauding mob of crank-fueled crazies, there is no doubt the Mossberg 590A1 with Speedfeed stock is a must-have at $608. However, bear in mind that you’ll probably need to fire only one or two rounds in a home-invasion crisis. Having the appropriate shotgun is valuable…using it for home defense can be another matter entirely. Mr. Bignell shared a welcome piece of advice that he gives to Griffin & Howe clients asking about purchasing a pistol for self-defense (Griffin & Howe does not sell handguns). Before sending the person to a reputable gun dealer, he counsels them to look in the mirror, when they wake up in the morning, for seven consecutive days. And each morning, he urges them to ask that face in the reflection: “Am I quite prepared to kill someone today?” Certainly, a sobering inquiry as we moved on to the shoot room. 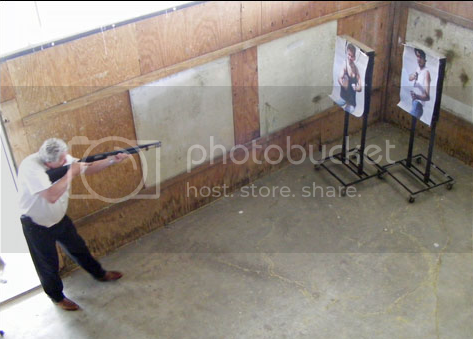 One of the exercises in the Blackwater shoot room was to determine if the person held a weapon or harmless object. Guy Bignell making a split decision on whether or not to pull the trigger. The shoot room is a mock-up of a home or office replete with rooms, doors and passage ways. Its walls are heavy plywood, the doors are designed to be quickly replaced after maneuvers. The shoot rooms at Blackwater also have cat walks for observing from above. We were issued Mossberg shotguns equipped with a Simunition conversion kit that lets your typical tactical weapon shoot Simunition cartridges and shells. In the Mossbergs, the conversion kit accepted specialized 2¾ and 3-inch hulls packed with tiny paint balls; otherwise, the Simuniton shotgun shells are designed to replicate the 12-gauge experience under live fire. Lighting was low, recreating the atmosphere of finding intruders who wake you in the wee hours. We engaged in an exercise called Shoot/No Shoot in which life-size, cardboard characters were holding different objects such as soda bottles, ordinary tools and weapons. 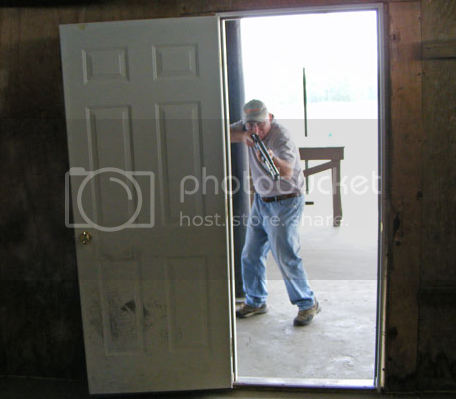 As you entered a room armed with the shotgun, you had to make an instant decision whether or not the individual posed a threat based on the item he held. I ended up shooting a guy armed with a bottle of Classic Coke, which was easily mistaken for a gun. I my own defense, I was being subjected to a strobe light as one of the trainers harangued me with a tirade from a bullhorn while I went room to room with shotgun at the ready. Nonetheless, my blunder hit home hard – a chilling conclusion to day one. Our second day started in the mess hall again and we promptly drove to the Driving Track. A quick whiteboard session was followed up by time behind the wheel of law-enforcement favorites: Ford Crown Vic, Chevy Caprice and Chevy Suburban. The driving scenarios simulated car-jackings, ramming and other ploys to either take you hostage or kill you. The objective was to escape. Our instructors were not quite the same caliber as you meet when trying to qualify for your driver’s license. These guys had seen combat – as did the cars, which were abused until rendered complete rubbish. Drive one of these vehicles and the Service Engine light in your car will never carry the same weight. The dashboards on the Driving Track cars were lit up with every malfunction, but still took an incredible hammering: power to American iron. Now watch our exclusive video of wheel time at the Blackwater Evasive Driving Program through our helmet-mounted camera. Just click here to get started. In the mean time, Griffin & Howe is currently offering their Blackwater programs in two, three and four-day courses. If you’d like additional information, please email [email protected]. Irwin Greenstein is the Publisher of Shotgun Life, the first online magazine dedicated to the best in wing and clays shooting, where this story originally appeared. You can read Shotgun Life at www.shotgunlife.com.